Gorgeous floral wreath wedding centerpieces can very easily be created as part of your reception decor using a floral wreath and a clear glass floating candle bowl if you are into DIY. Browse through this entire post for more inspiration and ideas for floral wreath wedding centerpieces with floating candles that you can design yourself. 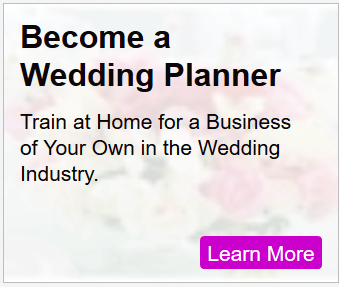 If you’re not into DIY, just show your floral designer these ideas and photos – she or he will know what to do! [Photo Credit: Derek Photography]. This round centerpiece design is ideal for your standard nine foot round reception tables. 1. Choose a wreath that has quite a bit of fullness and abundance to it, as pictured above. 2. Place the wreath at the center of the table and then position the floating candle bowl inside the wreath so that the wreath encircles the bowl. 3. Float 3 floating candles in the bowl. You can follow the color scheme shown in the photo or choose your own, however make sure that the color chosen for the candles nicely compliments the colors chosen for the wreath. 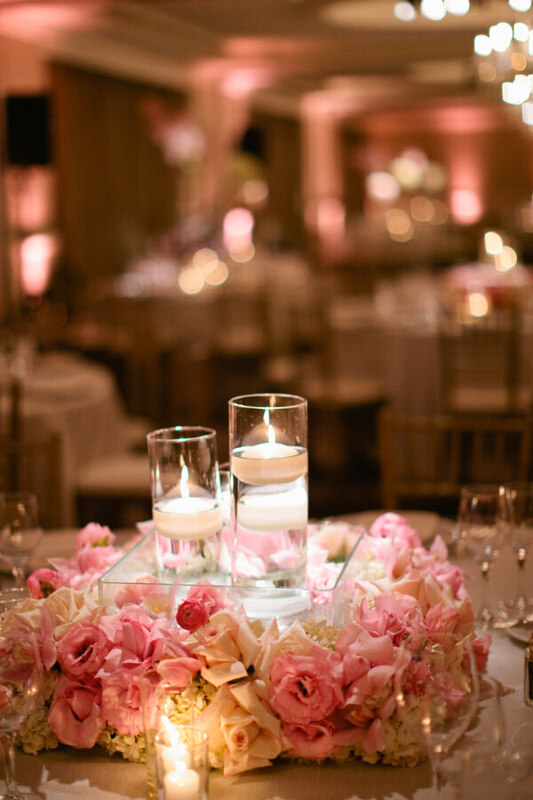 Surround the centerpiece arrangement with a few clear glass votive candle holders with white votive candles. 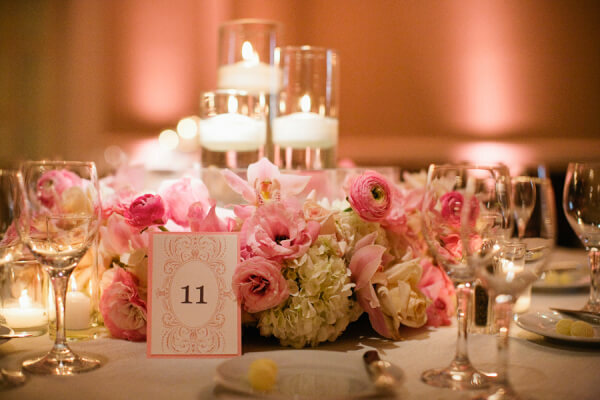 It’s as simple as that – your centerpieces are complete! 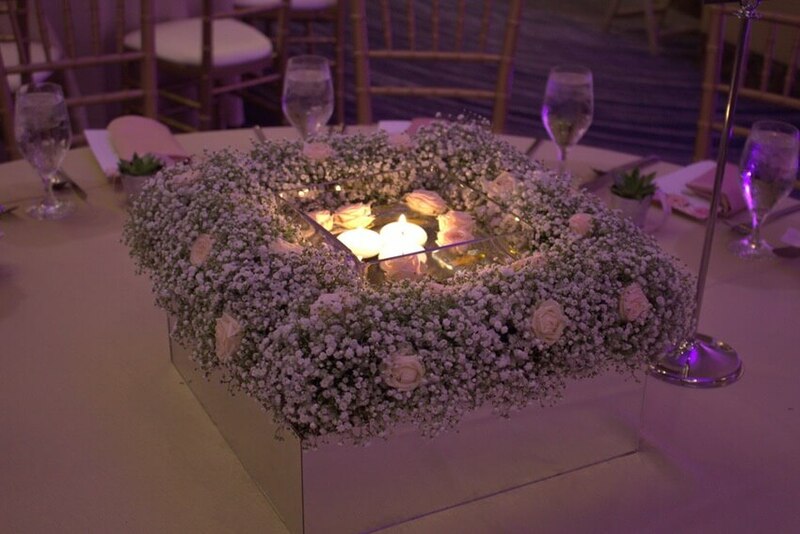 This next floral wreath wedding centerpiece with floating candles was designed by Elizabeth Ann Designs. 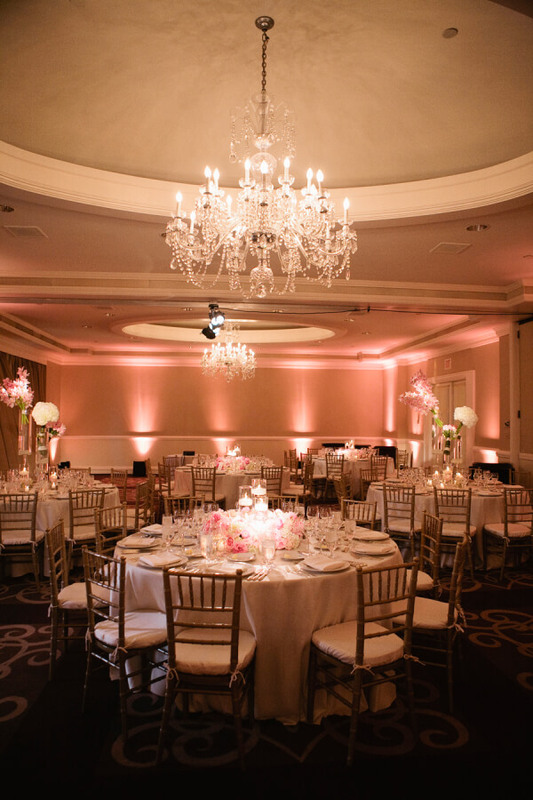 for a wedding at the Ritz Carlton Hotel in Laguna, California. Keep in mind that wreaths don’t always have to be round or circular. Here, things get visually interesting with a stunning square wreath made of an abundance of gorgeous fresh roses in pastel pink and ivory hues combined with ivory hydrangeas (which can just barely be seen in this photo – scroll down for another photo to get a better look at the hydrangeas in this design). The square wreath surrounds a low, square clear glass vase, into which three narrow cylinder vases of varying heights have been set in a cluster. Each cylinder has been filled with water and is completed with one white floating candle. This is a great example of what is known as “layering” in design; one design component (the wreath) is layered on another (the low, square clear vase), upon another (the cluster of cylinder vases), upon another (the floating candles in the cylinders). Its a way of creating a visually intricate design which carries a high level of visual interest. 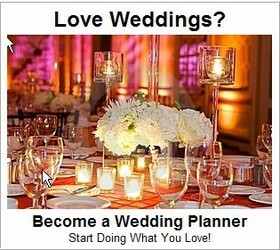 Check out the overall look of the centerpieces on the tables, from further back. Here’s another design to inspire you with more ideas for creating stunning floral wreath wedding centerpieces with floating candles. 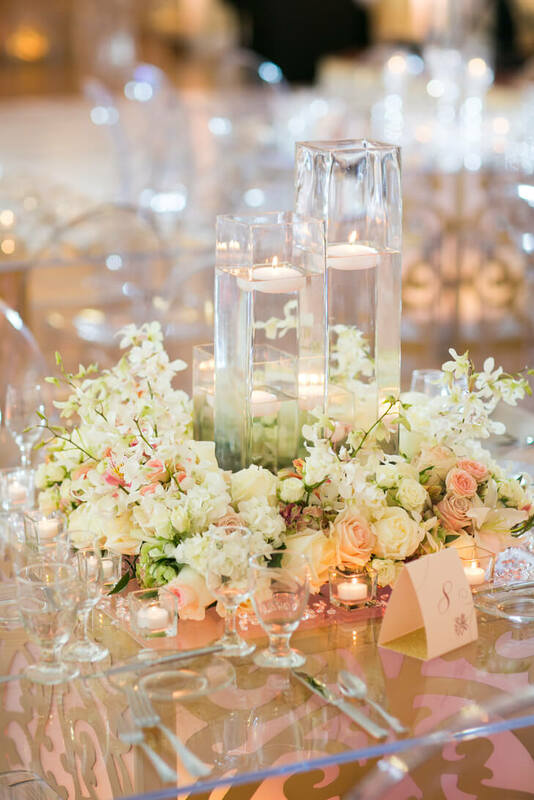 This centerpiece design idea is built upon a similar concept to the previous centerpiece design we looked at, only this time the floating candles tower high above the wreath in tall rectangular vases; the vases are similar to cylinder vases, only you can’t call them cylinders if they are rectangular in shape! Once again, the vases are filled with water, and a round white floating candle is placed in each vase. For this design, the wreath surrounding the vases could be either square, to compliment the squared off lines of the vases, or round – either would work equally well. 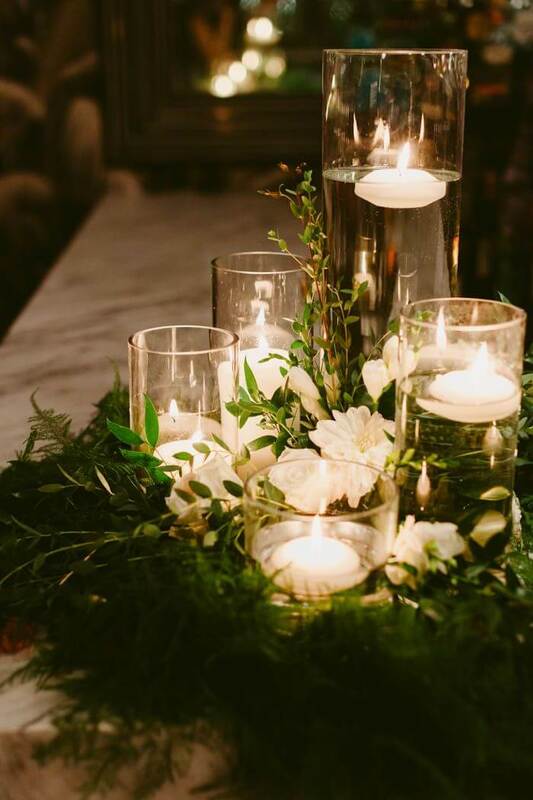 Putting yet another twist on the idea of a floral wreath wedding centerpiece with floating candles, this time the wreath is created using fresh greenery only – no flowers are added to the wreath itself, but rather, are inserted at the center of the wreath, in between the cylinder vase candle holders. Asparagus fern gives the wreath a soft, feathering look and feel, and a little bit of boxwood greens are mixed in for added visual interest. Once again, cylinder vases in varying heights and sizes (a total of five) are placed at the center of the wreath in a cluster, and filled with water. One white floating candle is placed in each vase. The flowers tucked in between the cylinders at the center of the wreath are white Mums (Chrysanthemums) combined with a white few roses. From Abricoe Designs, here’s another variation on the square floral wreath wedding centerpiece concept to inspire you. 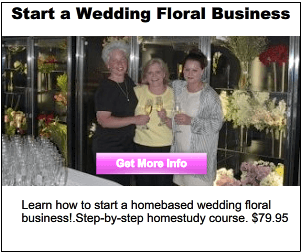 Use the five floral wreath wedding centerpieces we showed you here to inspuire your own design featuring floral wreath wedding centerpieces with floating candles!